More than 5,000 candidates would like to be elected to the Bundestag on September 24. But who are the people campaigning out on the streets? We met some of them around Germany. Jan Wieczorek (19) distributes flyers and pens in front of a shopping mall in Jena in central Germany on behalf of his favorite candidate, Christoph Matschie of the Social Democrats (SPD). He's a volunteer and says that politics have become one of his hobbies: "I could play video games at home, but then I would not achieve anything." He wants more open-mindedness from older politicians. Adrian Hurrle, a young dentist, represents the Free Democratic Party (FDP) in Freiburg. Campaigning should be fun: "Like when you invite the [Editor's note: far-right] AfD to a podium discussion about Christopher Street Day and the AfD people in the audience flip out, that's a lot of fun." Hurrle's motto: "Growing. Together." For him, integration is a fundamental part of living together. Wolfgang Hypko is a member of the local council for the Green Party in Osterode, Lower Saxony, a community of 24,000 residents. He supports his regional candidate in the upcoming elections. Hypko belongs to the first generation of The Greens, a fact he takes with a dose of humor: "I tried to knit once, but the only thing that came of it was a pot holder!" Güldane Tokyürek represents The Left party in a challenged district in Cologne – with 75 percent of the people with foreign roots. As a Turkish German, she has an advantage: She speaks the language of many of the people here. "My challenge is talking with the people and motivating them to vote. It's important for them to know that they can get involved and be a part of society." The satire party Die Partei ("The Party") has sent 18-year-old Floris Beer into the election campaign. He's competing in Frankfurt an der Oder, at the eastern edge of Germany, against the likes of the AfD's top candidate Alexander Gauland. But, like Die Partei itself, he's taking it in stride: He's well aware of real problems, but approaches them satirically. At 30, Emmi Zeulner is the youngest candidate to have ever held a seat in the Bundestag for the Christian Social Union (CSU), the Bavarian sister party of Chancellor Angela Merkel's Christian Democrats (CDU). She's running again for her electoral district of Kulmbach, where she's very popular. "Sometimes, it's only about compromise, and that's what you have to tell people." Christian Democrat (CDU) Wolfgang Bosbach is a regular guest on German television talk shows and his attitudes are often controversial and polarizing. In this election, his role is as prominent campaigner – not handing out pens and balloons, but using his voice to support candidates from the CDU/CSU. He himself is retiring from politics due to health issues. Christoph Matschie of the Social Democrats (SPD) was once a big wig in politics – among other things, as Thuringia's deputy governor. But things quieted down in 2014. More recent events, however, such as Brexit, the debates around refugees and rising nationalistic movements, have prompted him to take part in politics again in Jena. He wants to be an equalizing force. His motto: Live and let live. Alternative for Germany (AfD) candidate Timo Chrupalla likes to listen to people and notices "just how much his party is needed." In the eastern city of Görlitz, the far-right party has at least a 20-percent hold. Nice for him, but he still faces ugly stuff: "My wall gets spray-painted with swastikas and anti-fascist symbols. That now affects even my family." Being on the ground is nicer than being in the Bundestag, says The Left party candidate Kerstin Kassner in northern Germany's Stralsund. But when she's in Berlin, she can act as an advocate for the people of her electoral district. She knows a lot of people here, and people come up to her and shake her hand. Her motto is both local and global: "Peace. Joy. Western Pomerania." At 33, Thomas Ludewig could be considered one of the elders of the Christian-Democratic Junge Union ("Youth Union"). He is one of the four young men of Emmi Zeulner's (CSU) election campaign. "We always try to recruit as many people as possible to take part in the election campaign so that Emmi always knows that there are people who stand behind her and support her 100 percent." Greens politician Viola von Cramon wants to fight for her mountainous home region of the Harz. She aims to prevent tracts of land like this from being "left behind." The drop in population is noticeable in the region's infrastructure, like public transportation. Von Cramon wants to advance electro-mobility, and so during her election campaign, she bikes throughout her district to set an example. The CDU's Timur Husein from Berlin's Kreuzberg finds his district exciting since it's a mix of the former West and East. "The differences between the two districts are and remain vast, also with regard to the composition of the electorate, but that is what makes the place so special." 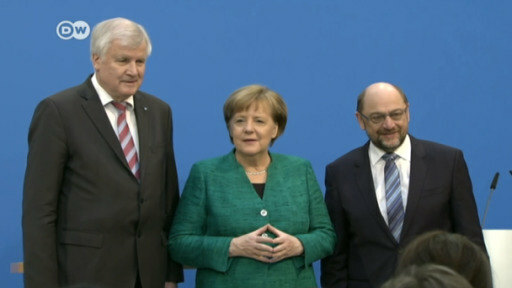 He wants to strengthen the CDU in the predominantly left-progressive area. Susanne Puvogel is a district council member for the SPD in Cuxhaven. She focuses primarily on poverty among older women. It's a lonely business, as it's not a hot topic among her party colleagues. But she adamantly says she will "get the topic on the table," if she's elected into German Parliament. The challenge for her rural electoral district: "Mobility! It's an existential issue!" Christmas in September? Student Sophia Blum (20) has raised a few eyebrows running through Freiburg in a Santa Claus costume along with three colleagues of hers, campaigning for the Free Democrats (FDP). But Sophia doesn't mind - she's proud to go to the polls for the first time in her life and to participate actively in the election campaign.